The number of apartment buildings in Edmonton-Centre makes getting in to campaign a bit of a challenge. In today’s underdog profile, it’s time to meet Akash Khokhar. He’s the PC candidate for Edmonton-Centre, held by Liberal MLA Laurie Blakeman for 15 years now. When you see those PC ads that say “Not your father’s PC Party,” Khokhar is the guy they want you to think about. Just look at the cute self-deprecating video his team made to help people pronounce his name. It’s an idea cribbed from Naheed Nenshi, who hired the same campaign strategist for his mayoral run as now-Premier Alison Redford. Khokhar shares more than a meme with Nenshi. He has a similar belief that Alberta’s leaders need to embrace its growing diversity. Alison Redford, he thinks, is the leader who best embodies the ways the province needs to change. I asked Khokhar how her leadership win influenced his decision to run, what it’s like bumping up against four decades of his party’s reputation, and how he hopes to unseat a queer-friendly MLA in a riding that scoops up Edmonton’s gaybourhood. 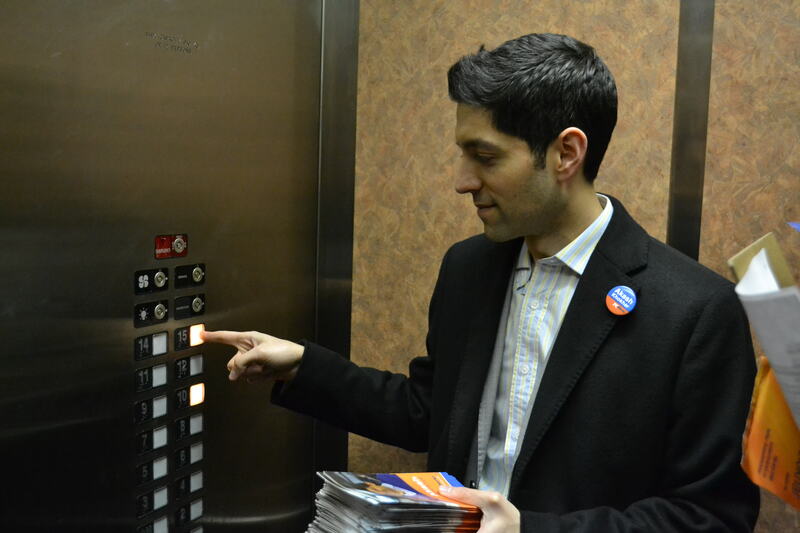 Campaigning in a dense downtown riding has its challenges — starting with getting inside buildings to see the voters. Waiting in the lobby of one older adult residence, Khokhar is finding it difficult to convince the building manager he’s willing to risk interrupting people while they’re having dinner. The door buzzes and we walk inside. A lawyer specializing in insolvency cases, Khokhar can be firm. But he’s also the kind of person who’s met voters twice in one day: once while door-knocking, and once while delivering Meals on Wheels. He’s the co-owner of Suede Lounge on Jasper Ave, and he does pro-bono work on eviction issues through the Edmonton Community Legal Centre. In other words, he’s out there in the community. After studying international relations in California and doing a law degree at the University of Toronto, Khokhar came back with some clear ideas about the strengths of diverse cities. Khokhar’s ideas seem to fit the bill of a model “progressive conservative”: the way we run our communities and our province is basically fine, it just needs some tweaks to provide better business and social supports. For example, I ask him what he’s learned from working for people facing evictions. Legislation for tenants is pretty good, he says. The big problem is access to justice. He thinks more dispute resolution mechanisms would help ease the burden on the courts and are less intimidating and pricy for poorer people. It’s easy to see why Khokhar was lured into running by Alison Redford’s party leadership election last year. Her turn towards the Joe Clark-style progressive wing of the PCs is palpable enough that it’s fuelled the membership exodus bleeding supporters further right to Wildrose. “Everything I went to law school to do, she had done,” he says. Redford had worked as a human rights lawyer, worked with Nelson Mandela, and come back to become Justice Minister and Premier. On social and fiscal issues, she just seemed to be a fit for him that came out of nowhere. It was enough to persuade him to run for office for the first time. On fiscal issues, he says he supports Redford’s plan for results-based budgeting (re-examining the value of all department spending from zero up, rather than looking for simple cuts or additions to what’s there). Having seen government from the inside working for Intergovernmental and International Relations, he says it’ll help identify inefficiencies and stop budget inertia. “I think my job could have been done by someone who was already there,” he offers, laughing. Of course, the timeline of Redford’s influence as leader means he was only nominated in January. He’s been campaigning hard since then, but three months of groundwork puts him far behind the incumbent Blakeman’s name recognition. What does get a lot of recognition is the PC name. It’s hard to imagine joining the party at a worse time for a new candidate. Khokhar points out that about half of their candidates are running for the first time, but they’re facing the reputation of 41 years of PC rule. That’s a lot of other people’s decisions to wear for a rookie. At one apartment we come to, for example, the man at the door says his biggest problem right now is with the federal government, and getting disability support. Khokhar points out that Redford has only been premier for six months but has already raised AISH, an income-support program for people with disabilities. “Too little too late,” the man says. Khokhar may be new, but it’s inevitable he faces tough questions for his party’s decisions from the left and the right. One man speaks to him entirely in French (and Khokhar plays along gamely) until he’s had a chance to point out Tory flaws in providing arts funding and affordable housing for 50+ year olds. Another says he’s a PC supporter, but works for Enbridge and worries whether Redford will push hard enough for the Northern Gateway pipeline. A seasoned campaigner walking with us interjects that she’s been fighting hard for its approval. This too reflects the legacy Khokhar is working with. Most of his campaign team are young faces, but this shmoozy campaigner is a senior policy advisor, and has been working for the PCs for decades. It seems like second nature to him to lean over and suggest notes I should be taking from a speech he makes on arts funding. How much can a party with so many insiders left change from an institutional culture that’s been battered by years of scandals over entitlement and corruption? Khokhar himself isn’t boxed into Klein-era ideas, and it comes out (pardon the pun) when I grill him about queer issues. Having lived in Oliver myself before, I ask him how he thinks he would represent an area with Alberta’s most prominent gaybourhood better than Blakeman. The first time I met Khokhar was actually at Suede, when they were hosting an event for the leaders’ debate. At that time, he seemed vague about his thoughts on Bill 44’s rules on teaching material related to religion, sexuality, and sexual orientation in schools. He frowned and said Blakeman didn’t have a monopoly on supporting minority rights. Still, he hadn’t even heard of the government’s decision a few years ago to cut funding for gender reassignment surgery. GRS can be crushingly expensive, and it’s a serious issue for transgender folks who need to make a physical transition. But by the time I sat down with Khokhar in his office, he’d asked Redford about it, and gotten a commitment that the funding would be re-instated. “I think that’s right,” he says. This weekend: the final underdog profile. I’ll be talking to Meagen LaFave, the Wildrose candidate in Edmonton-Strathcona.